I did installed bluestacks on the computer but will be same if you install on a laptop. Already two posts related to how to install android on pc laptop or computer with various applications such as android sdk emulator,youwave and android x86. Among each emulator has advantages and disadvantages depending on how we rate. For this time I give a brief tutorial on how to install android on a laptop or computer with a Windows operating system using BlueStacks. What is bluestacks? BlueStacks is Android emulator application that can be used on the windows so we could use the android on a laptop or computer along with the windows. Any version of Windows that can be installed BlueStacks? Windows that can be used BlueStacks among others, windows xp, windows 7 and windows 8. We need net framework as an additional application before we install BlueStacks because without the net framework BlueStacks will not run. In addition, look at the specification PCs / laptops are used, BlueStacks is android application that I think a lot of the used. Here will give you tips on how to install android emulator on Windows 8 with BlueStacks and computer specs are slightly lower its specs insufficient, because its onboard VGA and not HD and 1gb of ram, use earlier BlueStacks beta version 0.7.0721. And here my computer specifications. And this before you install bluestacks your PC must have Net framework installed in your PC. 1. Download BlueStacks old version for low graphic or VGA here choose BlueStacks beta version 0.7.0721 or if the computer or laptop with good specs that BlueStacks can download here, which I use is windows 8. 2. After downloaded open bluestacks to install with double click and click accept ... If there will be options for such notifications and in app purchase now that the free app would be selected or not that's okay. 3. Click the install button and wait until the process is complete. 4. This is a common problem, at the time of install BlueStacks is running an error message like "your graphics hardware or dirvers do not support apps ......" just click ok. If BlueStacks continue the installation it will install normally but if at the time of clicked ok BlueStacks does not want to run or even rolling back install the BlueStacks will not be installed. You must update your vga driver to a better version or re-download BlueStacks app with the older version. 5. If the install is complete it will automatically open BlueStacks application, just play the android apps with BlueStacks. 6. Or if BlueStacks is not running automatically so we just click it on desktop or in the program files. 7. 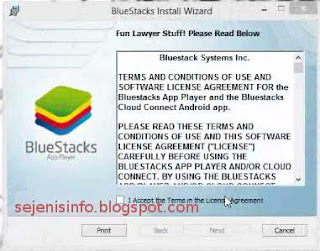 For how to install android applications apk in PC or android app to bluestacks like whatsapp messenger or other apps can be done with BlueStacks app or download android apps apk to your computer and then double-click the apps that will be installed to bluestacks and apps will be automatically installed to direct BlueStacks, or by direct download or install on the BlueStacks apps. Consider once again the PC specs that I used above so that nothing was left out of what will be done on your PC. Because so many comments it seems they do not see my computer specs are used. With BlueStacks we can use the android emulator should like android phone, but the problems during the installation may often we found as I have mentioned above. So if it will install BlueStacks note see for Bluestacks requirement of these are compatible with PC being used, so the problem will we know when to install BlueStacks. Note: Orca is basically a MSI package editor. 2) Install Orca & then right click on Bluestacks Installer and select "Edit with Orca"
3) Then in the window opened select "LaunchCondition" in left panel and delete the row with condition as "Installed OR PhysicalMemory>= 1024"
4) Similarly select "InstallExecuteSequence" form the left panel and delete the row with Action as "CheckMsiSignature"
how to delete delete the row with condition as "Installed OR PhysicalMemory>= 1024"
BlueStacks_HD_AppPlayerPro_setup_0.7.17.916_REL.msi .i need to delete that line "PhysicalMemory>= 1024""
It still not work.. now what to do??? what is the problem ? can u tell the error message ? What is your computer specs ? How to get access to the conversation stored in the computer? Secondly i bought a phone number from a guy to get my whatsapp activated. He got me the sms code of it. Can he get access to my conversations/ contacts? 2. If he now about your whatsapp login like username and password, he can access your whatsapp conversations / contacts. my suggestion you must change your whatsapp username or your password. And in December 2012 a few people who have the expertise to steal from whatsapp conversation by hacking. i am using Bluestacks version 0.7.0 0721. There i cant access my whatsapp dats i guess. Secondly regarding whatsapp security, whatsapp just asked me to put a phone no, when i installed it on bluestacks. then a sms code was sent to the phone number i bought from my friend., he gave me the sms verification code also and there after i am using that number on my whatsapp. It never asked me to setup a username/password thing. if so he cannot acces your whatsapp cause he must login with your number and verification code by sms will sent into the associated number. mas,, kok saya instal, sukses tapi ga bisa maen angrybird, kata nya eror gitu, nah uda gitu saya uninstal dan instal lagi,, tapi malah tambah error. 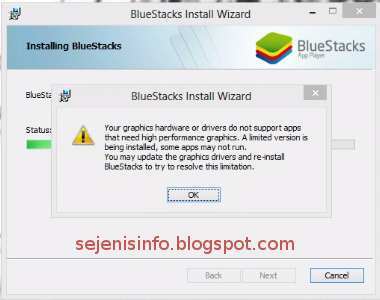 bluestack runing terus dan minta close program. pertanyaan saya gmna cara menghapus semua akibat error instal bluestack. ini specs lepi saya acer 4736.mksh. i hav windows xp, with p4 procesr. with 1 gb ram!! wat shoould i do to download watsapp!! how MB / MegaByte your VGA or graphic do you have ? i cant install,it is asking me to look for a file on my computer, C:\user\rhafee~\appdata\local\temp\msi11112\log.pls how do i fix. are your pc already netframework installed ? i have it on my system already,i am using windows 8. Action ended 0:14:00: ExecuteAction. Return value 3. I dont know exactly about this problem..
1. what is your OS ? Hi, can I install version 0.7.0721 for offline mode. if not, can you provide the link where to download please. http://lnx.lu/1mtl and http://lnx.lu/1mjX are all about ilivid. thank you. kalo ada keterangan "apk Installation Failed : INSTALL_FAILED_OLDER_APK"
pas install aplikasi cara betulinnya gimana ? Itu dikarenakan bahwa apk tidak bisa di install karena versi bluestacks yang masih versi gingerbread sedangkan aplikasi yg diintsall hanya bisa di install di android ICS keatas misalnya. may be your bluestacks is for windows 7 32 bit . I tried your tutorial perfectly and yes I don't have the error message anymore. However, application isn't installed at the end. It was looking for C:\Users\Samsung\AppData\Local\Temp\MSI something. What should I do about it? you use samsung laptop ? have you try to disable your anti virus and windows defender ? im using Intel atom and GMA 3600 with 700mb Graphic Card and 2gb ram. can ima install it? can i play clash of clans with this? Hi, i installed bluestacks on my computer but my compture is Desktop PC. so i havent wireless adaptor or card. and i can not turn on bluestacs wifi :( Can you give me virtual wifi adaptor or card ? sir when i click on bluestacks it was not giving the options to open with orca? I'm sorry i have not tried this so i can't give the solution. I have Lenovo laptop with "intel core i3" processor, windows XP SP3 and 2GB RAM. I don't have any graphics card installed.. so, Am I able to use Bluestacks? ?